A Prominent pro-democracy and Non-Governmental organization- HUMAN RIGHTS WRITERS ASSOCIATION OF NIGERIA (HURIWA) has asked President Muhammadu Buhari and the National Assembly to work out a comprehensive budget and build houses for all members of the Armed forces killed in the line of duty in the ongoing counter terror war to be called "HEROES ESTATE ABUJA". HURIWA in a media statement by the National Coordinator Comrade Emmanuel Onwubiko and the National Media Affairs Director Miss Zainab Yusuf also called for the establishment through an Act of Parliament of a National War Heroes Hall of fame in which an expansive museum should be erected in a part of Nigeria with the mandate of enlisting all the fallen heroes who died whilst defending the territorial integrity of Nigeria from the grave threats constituted over the past ten years by armed boko haram terrorists which has led to over 25,000 casualties of both civilians and military. The precise location of the Museum should be decided by the people through a coordinated phone votes..
HURIWA said the rebuilding and reconstruction process of the North East of Nigeria must of necessity include comprehensive compensation packages for Nigerians of Southern extraction whose entire life savings and assets were lost to the insurgency including the losses they suffered in their businesses just as the Rights group stated that there was the need for the Federal government in partnership with the States of the North East of Nigeria to compile records of all the actual victims of the terrorists attacks including all the persons sheltering in different Internally displaced persons camps and all the victims who are refugees in Cameroon and Niger Republic. The group criticised President Muhammadu Buhari for refusing to prosecute his erstwhile disgraced Secretary to the government of the federation Babachir Lawal who allegedly mismanaged over half a billion Naira from the North East of Nigeria reconstruction fund. 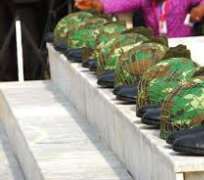 HURIWA made these observations against the backdrop of the marking of the year 2019 Armed Forces Remembrance Day even as the group regretted that the President Muhammadu Buhari's administration had paid more emphasis on the resettlement of the so called 'repentant boko haram terrorists' who wreaked havoc on the people of North East of Nigeria for years and the same government has failed spectacularly to attend to the yearnings, aspirations and needs of the victims of the boko haram terrorists attacks who have been denied social justice. "It's only in a banana republic that the so called government will value violent criminals rebaptised as repentant terrorists whereas the victims of these bloodletting are left to suffer without any form of assistance from government. We hereby call on the National Assembly to wake up and demand from the Executive Arm of government that it respects the Constitution by bringing decisive justice to all terrorists and also delivering lasting justice to the hundreds of thousands of the victims of these heartless and relentless attacks by the boko haram terrorists". HURIWA recalled that the Executive Director, Victims Support Fund (VSF), Dr Sunday Ochoche, said that N54 billion was pledged at the fund raising organised to support victims of Boko Haram insurgency in the country.